This is a nice acid synth! Virtually the same synth as the SH-101 but without a white noise generator. I sequence this over CV with live tweaking, but when it is played from its onboard sequencer you can take advantage of the accent and portamento functions making it sound very close to the classic 303 acid. 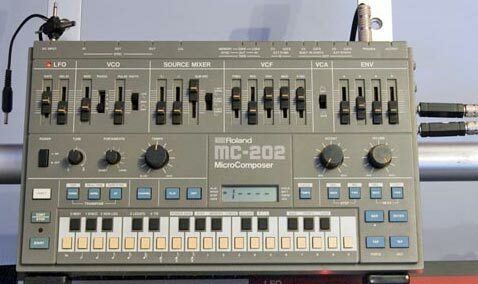 Personally I love it for its warm 101 sounding synth tones, bubbly lfo acid riffs and resonant fx such as drum sounds and zaps. You can get the classic SH-101 bass sounds in the normal way using the pulse width to fatten it up. My MC-202 has an add-on retrofit on the side with a new set of CV/Gate/Filter/Porta mini-jack sockets. I don’t know anything about these as they were already installed when I bought it, but I do know it adds a VCF mini-jack to control the cut-off via voltage and a mini-jack for portamento on/off so that you can achieve the same acid riffs as its onboard sequencer. I don’t know if this is a common issue or not but my octaves went out of tune. Twice the octave; twice the amount of pitch deviation. I now understand this is VCA width and there are two pots inside the synth that are used to calibrate this. Actually what happened was that I calibrated the synth (see page 6 of the Service Manual) and it sounded fine on its own keyboard but then realised the pitch problem was their while controlled by CV. This was caused by my MIDI-CV box being out of tune, that also has a trim pot located on the side which fixed the problem. Also note that sometimes I sometimes get the same problem if the CV plug is removed or knocked while the synth is on, simply unplugging and plugging back in seams to fix it.